Well how good was that? A terrific turn out on Sunday with lots of family and friends to help us celebrate a summer of paddling. I think I will forever hold the image of Taylor jumping overboard, disappearing beneath the water, closely followed by Hayden, who seemed to ‘roll’ out of the other boat – no, not to rescue his sister, but to beat her to the clue which was nestling in the reeds! Thank you both for adding fun to the day and I hope you didn’t get too cold. Then there was the clue that almost got away – over the spillway. Nathan was seen hanging off the bridge retrieving it before it crashed to the other side. It was so good to see Terry back in the boat. Terry has a way to go before he is 100% and will no doubt experience lot of frustrations along the way – hang in there Terry, every day is step closer to full recovery. It was a day of firsts really – Women getting in the boat for the men v women race found water coming in a great rate. Umm, at the working bee, did the blokes really forget to put that screw back in? Then both boats became grounded – at the top end of the lake?, don’t know how Phil’s boat got themselves afloat again but few of our people overboard and couple of visitors moving to back of the boat and we soon floated free. And how was the paddling with the paddle handle ? only caught couple members trying to cheat on that one! Monster Raffle – Gail and Bev thank the 3 members who’ve added to the raffle – there’s still room in the wheelbarrow for more and as the tickets have not yet been printed you have few more days to add to the barrow . Good luck to our younger members who are doing HSC this year, I’m told pressure is building up – or not – in the case of students who are pretty laid back by it all. Maybe its just the parents feeling the pressure! Alex, as if he doesn’t have enough to do – is heading to Adelaide this weekend with the Orange High School Band for the National Band Championships. Good luck from all members Alex. Car Boot Sale – June Start clearing out the garage, sort out all those books. We plan to have special book stall as well. But you can also have your own site and sell all those unwanted items from your shed. This is planned for early June, date to be confirmed. Will be needing some help, especially over the next few weeks getting the word out there. Car spaces will be available at $20 each for NON Club members, $10 for members. We had a really good working bee at the boat shed little over a week ago. At one stage I saw Ian under the trailer fixing something, Jo Krats sanding the gunnwales on one boat, Yvonne, Warren and George were putting blocks in the 2nd boat, Phil Lambert putting final touches to the roof, in order to meet Councils requirements. I don’t think Kristy and I are going to be let loose with the paint pots again, we just don’t seem to see things from an artists perspective – but we did fix our errors – so if you weren’t there you won’t know what we did! Chocolates – we seem to have lot of chocolates out there and little money coming in. In fact we ordered a 2nd lot due to demand but we haven’t received money back in to cover cost of the first order. Could those who have money or chocolates please get them back to Gail, Bev or myself. End of financial year is fast approaching and we need to get everything in order before then. Paddle Order – I haven’t placed an order yet as not enough people requesting them, Will leave it till spring comes and we start traing for the 2 km race! Long Weekend– June 09th/10th–some are planning a trip to Lake Cargelligo. A morale boost for the Lake Cargelligo Club and good for CCDragons to have lots of paddling space. The paddling will take place in the Saturday afternoon giving us time to travel over in the morning, I know some are thinking of staying Saturday night in Lake C – so good opportunity for us to socialise. July 03rd – Barbeque at Bunnings. Ella is going to need lots of helpers. This will clash with a Governance Workshop which is to be held in Orange. DBNSW advises it will be mandatory for 4 committee members to attend. Issues to be covered include Constitution, Legal Issues, Conflict Resolution and Risk Management. Its sad that its become compulsory for Clubs and other organisations to learn about these issues. July 11th HARRY POTTER movie, the very last one to be made. At this stage we have the whole cinema booked – fill that and we could almost buy TWO boats!! 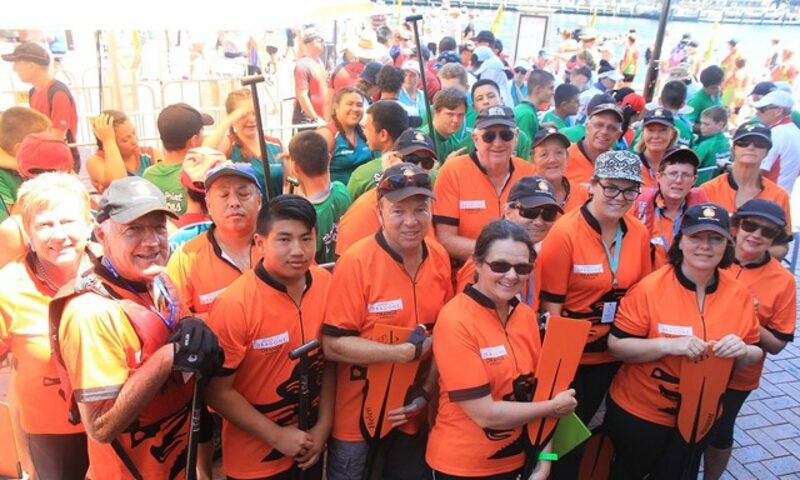 Kamini Jain – the Canadian coach of world champion dragon boat teams is again heading down under. STRONGLY encourage everyone interested in developing their paddling skills to competition level to attend. Keep October free. Kamini will be at Myuna Bay again for 3 days BUT …………..fingers crossed we can entice her west of the mountains. Content: some of the subjects covered are Role of the Coach: Planning; Teaching Skills and Communication; Physical Conditioning//Physiology; Racing regulations; Safety and the Law. Colour City Dragon Boat Club Regulations and Constitution. This huge task is now complete. There are couple of late additions to the Regulations. One relates to paddlers from other clubs, the 2nd addition relates to Club’s policies on training courses – please be sure to read it. Land training for winter – watch this space, several options in the pot – we do have the erg machine now which will help us maintain aerobic fitness.